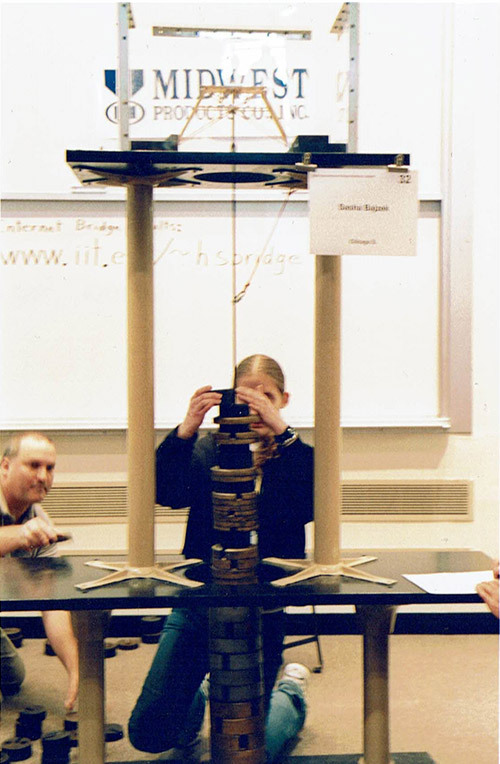 Sasha Bajzek (CE ’11) adding weights to her entry in the 2005 International Bridge Building Contest. As a high school pontist, what interested you specifically about participating in a bridge building contest? I love creating things and solving problems. 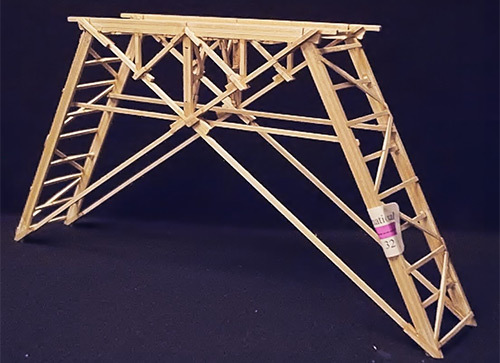 We had to build a bridge for my physics class, and I was fascinated that something so light could hold so much weight. My winning bridge weighed about the same as four nickels but could hold more than 200 pounds. I can’t even come close to picking up 200 pounds! I wanted to learn more about the engineering behind it, and it became very addicting trying to get each bridge to hold more. My bridge was an A-frame design. I got the idea looking at one of the work benches in my parents’ basement. My winning bridge weighed 0.044 pounds and supported 207 pounds, for a total efficiency of 4,738. Did you learn something from participating in the contests that helped you in your career? The thing I learned from the contests that has stuck with me the most in my career is tenacity. I built 20 test bridges to perfect my design, learning from each one what I could do to make my bridge stronger and lighter. I use that tenacity every day as an engineer. I work to make things as efficient as possible, which involves a lot of learning from mistakes and keeping at things until you achieve a great design. Why does the contest continue to be relevant more than 40 years after its founding? The contest teaches students about physics and engineering, which are present everywhere in the world. It takes learning about compression and tension in structural members out of textbook learning and into the physical world so students can better connect to the concepts. It also demonstrates the importance of iteration in engineering design with the best designs having been proven through many test runs.